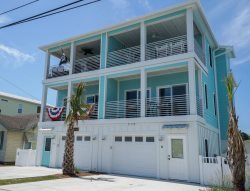 Beautiful 4 bedroom 3 bathroom duplex with some ocean views, located within walking to distance to Johnny Mercer's Pier, bars, and restaurants. Walk out your door, across the street and past a few homes to access Wrightsville Beach's beautiful sandy shoreline and blue Atlantic ocean. The Sea Hawk has many features and upgrades such as an outdoor shower, covered car port, one car garage, fenced yard, plantation shutters, granite kitchen counter tops, and hardwood floors. This is the perfect vacation home for a large family or multiple families. Large master bedroom has a king size bed with en-suite has a private deck where you can see the ocean. Each bed is equipped with comforters and pillows and we offer optional linen and towel service. We also provide paper towels, toilet paper, trash bags, and dish soap, and dishwasher detergent. Kitchen is stocked with skillets, pots, and pans in a variety of sizes, serving bowls, utensils, cutting board, etc. This property does not allow pets of any kind. We are also a smoke free property. Evidence of smoking or pets will result in a $500 fine.